You want the real deal. 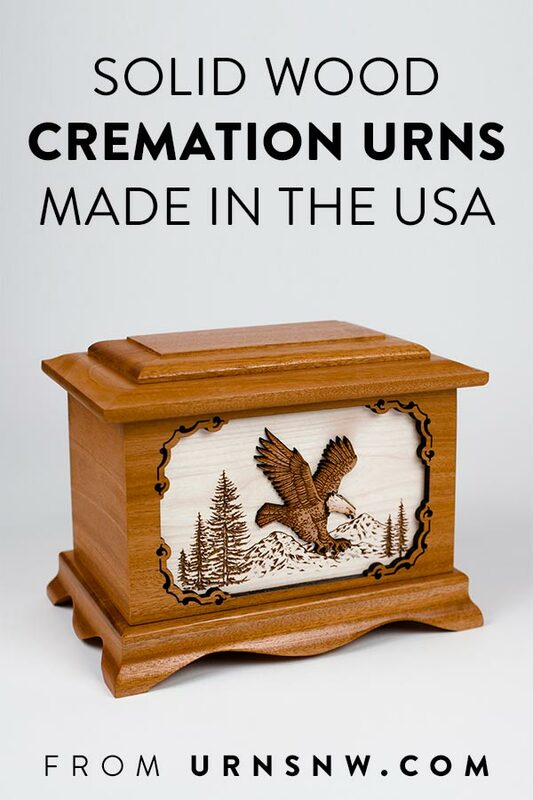 You want solid wood cremation urns, made in the USA. I’ve had too many customers come to us after making the mistake of buying a knock-off on Amazon or some other site. There is a reason you find an absolute rock-bottom price on Amazon or elsewhere. The reason the price is so low is because the quality is so low. In fact, many times I’ve seen not just the design of a quality solid wood cremation urn ripped off, but they will steal the product photo too! Let’s take a closer look at some of the cheap urns before we get into the real, genuine made-in-the-USA solid wood urns. 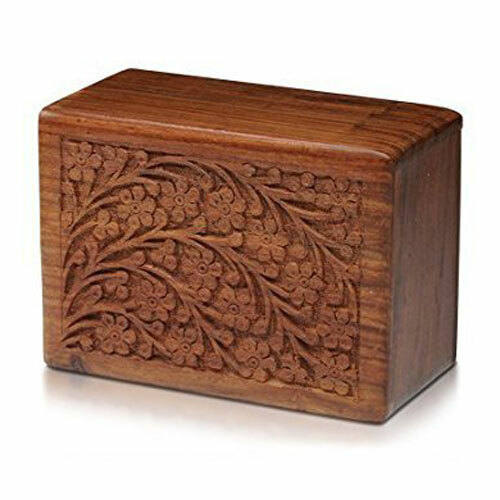 Let’s start with the #1 bestselling cremation urn on Amazon, the Hand-Carved Rosewood Urn Box. This is a decent looking urn, and it gets pretty good reviews. For about $30, it doesn’t look bad at all. This is a best-seller because there are multiple sizes, some quite small, intended for pets or a portion of the remains. From the reviews, it sounds like most people are purchasing this cheap urn as a nice memorial box for pets, and as such it works pretty well. The description doesn’t say if it is real wood, and the bottom panel just slides out. Everything about this says that it is a $25-50 box, so if that is what you are looking for, you won’t be able to beat the #1 bestseller on Amazon. So some imports can turn out to be a good deal, if budget is your primary concern. Most, however, have a noticeably inferior quality. If you look around further on Amazon, you will see very few wood urns that are under $100 and highly reviewed. Even the ones that are offered are intended primarily for the cremated remains of pets, whose owners want something that seems nice-ish but without a huge price tag. Almost everything you find quickly on Amazon (or other similar sites) are inexpensive, low-quality imports. But that’s not the worst of it. Some sellers even go as far as using the photos of the real, high-quality urns and claiming them as their own! We will start with a photo of the real deal. 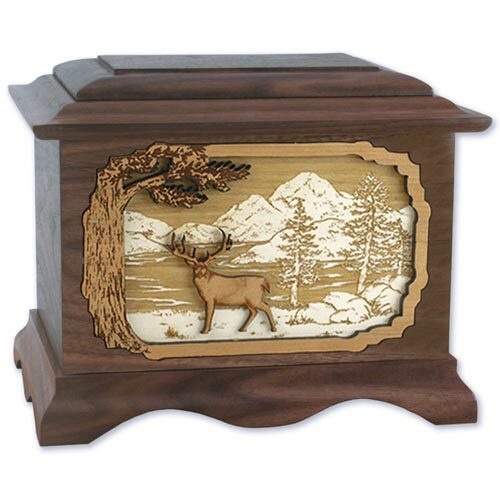 This is one of our most popular wood urns, which we’ve offered for nearly twenty years. Again, just to be clear, this is the genuine product. Each one is individually crafted from genuine mahogany wood right here in the USA. Solid, durable, and long-lasting, with heirloom quality and a premium finish. The urn is designed to fit a personalized inscription to the side of the cross, which we laser engrave into the surface of the wood for a permanent epitaph. This is a good product. With engraving, it runs about $300 and is worth every penny. But not every urn is like this. Now let’s take a look at the knockoff. It’s the exact same photo! You can even see the last part of the “UrnsNW.com” watermark which they neglected to fully remove. Offered by Deva International, based in India, they simply stole the photo from our site and passed it off as their own. That doesn’t look too great. But since they stole the photo from our product, there’s no way to know if they stole this image as well. Which means… the real urn they actually make could be worse! Now, granted, this is from a wholesale supply company. Who knows where these urns actually end up, if they even sell. But that’s the point. There are plenty of knockoffs out there. Some online vendors or funeral homes may even buy these cheap urns, take better photographs, and pass them off as low-to-mid-range urns in their collections. Are these imports good quality? Probably middling, at best. Are they real wood? At a cost of $10-15 each, doubtful. I’m sure you can think of other benefits as well. 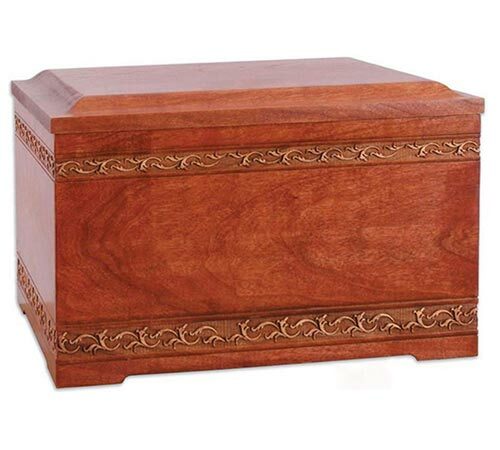 If you are looking to get a permanent resting place for your loved one’s remains, you will almost certainly prefer a solid wood cremation urn with made-in-the-USA quality to ensure that at some point in the future the box doesn’t fade, warp, split apart at the seams, or worse. So let’s look at some of these premium quality memorials. These are solid wood cremation urns, all made in the USA and available at Urns Northwest. First, we’ll show you some budget-friendly (yet still superior quality) options, then we’ll move on to the premium wood art pieces. 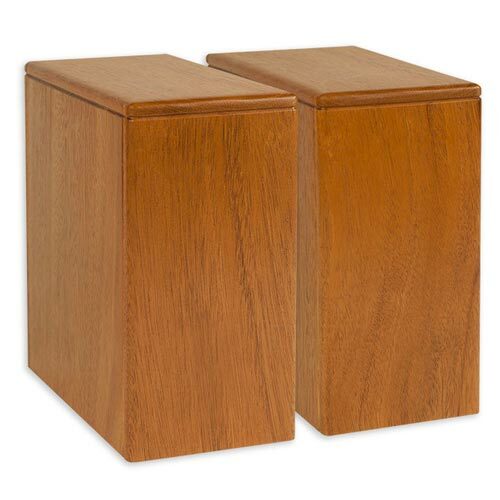 These urns are crafted individually to order in America using genuine solid woods with elegant and natural finishes. These aren’t going to be at the rock-bottom prices you might find on imports at major distributor sites, but they are the real deal. 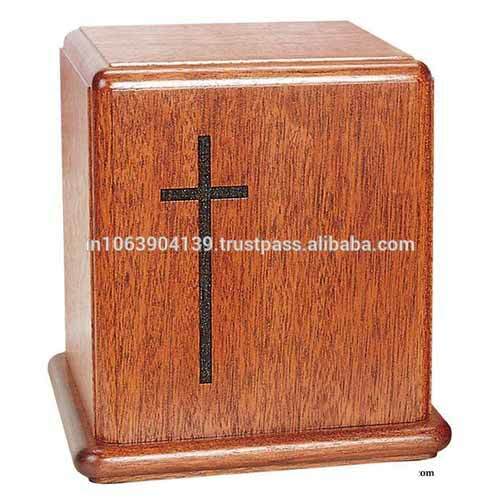 Modestly priced at $149-249, each of these solid wood cremation urns are well worth the cost to honor your loved one. The “Hamilton” is our top budget-friendly urn. Very reasonably priced, this one is available in your choice of (as shown in the photo, top to bottom) Walnut, Mahogany, or Natural Cherry. We can also do Stained Cherry and Oak. All of these are the real, genuine woods, no laminates or particle board. This is a beautifully simple and classic urn that is ideal for laser engraving of name, dates, and other inscription. As mentioned above, we laser engrave directly into the surface of the wood rather than attaching a plate. 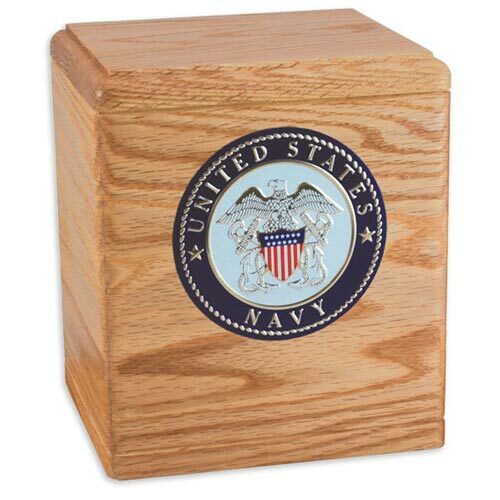 The “Freedom” is our budget-friendly solid wood cremation urn designed for veterans. Crafted in the USA from your choice of real solid wood, this classic military memorial includes a service branch medallion and has plenty of room for laser engraving of name, rank, dates, and more on the front. The “Boston II” features a classic design that balances perfectly between stately and rustic. 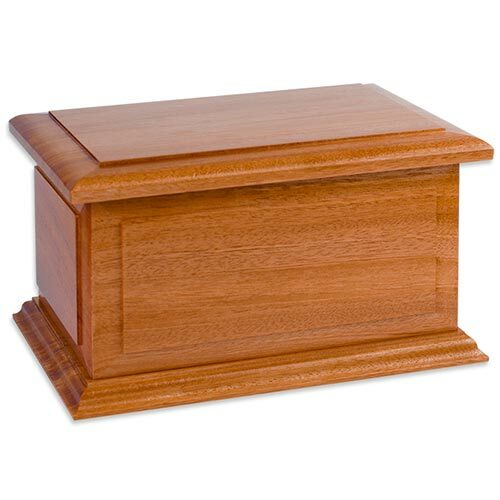 This elegant urn can be made in your choice of genuine Oak, Mahogany, Cherry with a medium Cherry stain, or Walnut wood. Also available in companion urn size to hold the remains of two people. 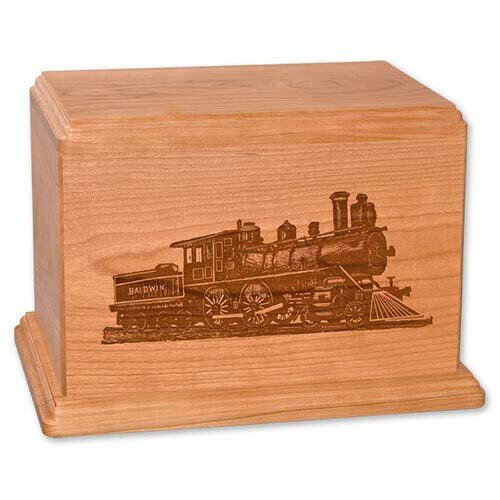 Our lovely Cedar Wood Cremation Urn is made in Oregon using select aromatic Tennessee cedar wood. As with all wooden urns but doubly so with cedar, each urn is one-of-a-kind due to the unique grain patterns of the wood, which ranges from light amber to rich oranges with hints of red. 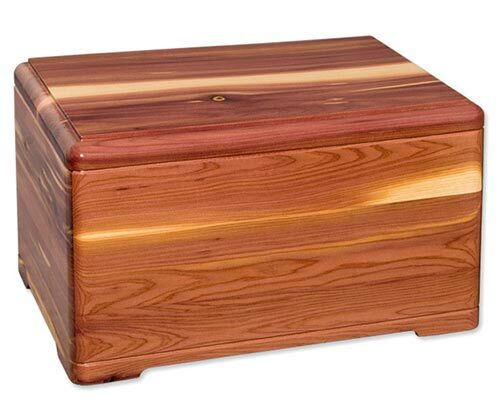 These solid wood cremation urns are designed to fit into nearly any funeral home niche. The dimensions were set specifically to accommodate the niche spaces at Arlington National Cemetery, and can fit as a single urn, two separate urns, or a single combined “companion urn” for two people. A single standard sized urn measures 8.5″ x 8.5″ x 4.25″. Combined, two of these urns side by side measure 8.5″ cubed, and the companion urn has the same 8.5″ cubed dimensions. Add-ons and customization include choice of wood type, laser engraved inscription, and military service emblem medallions for veterans of the armed forces. 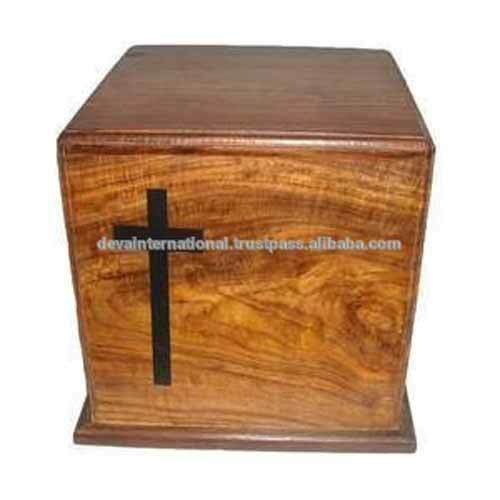 If you are planning to scatter the remains someday, we have a beautiful wooden urn designed specifically for ease of scattering. 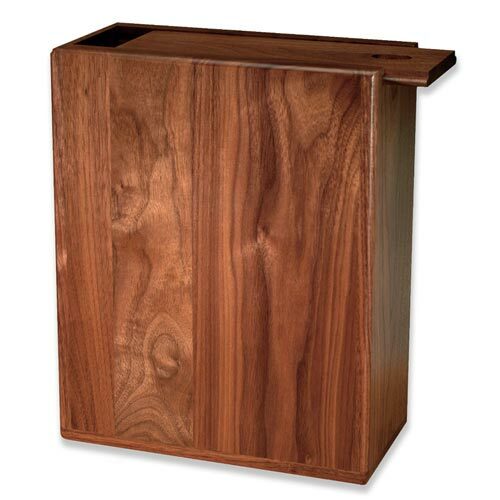 Crafted in the USA from solid Walnut wood, this elegant piece features a top-sliding opening with magnetic release. This keeps the remains secure for the memorial service or while kept at home, yet also makes the scattering simple and worry-free. 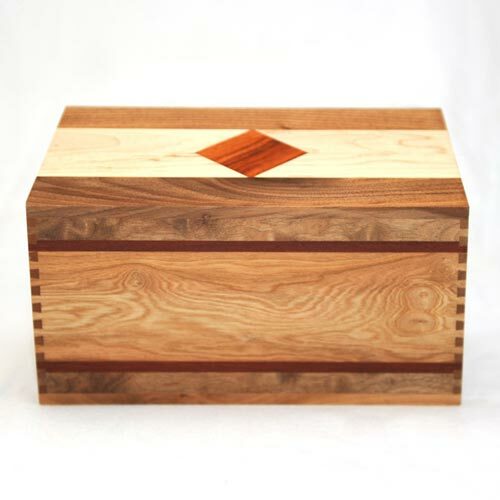 These premium solid wood cremation urns – all made individually here in the USA – take craftsmanship to the next level. We proudly offer a selection of over 50 incredibly detailed 3-dimensional inlay art scenes. These are made using layers of solid woods in their natural colors, etched in fine detail and inset within the urn to create a lifelike art scene. Themes include nature, wildlife, sports and hobbies, and much more. In addition, we also have many wood urns that highlight the unique characteristics of natural wood. From hand-turned urns to creative shapes to classical ornate boxes, we boast the very best solid wood cremation urns available on the market. 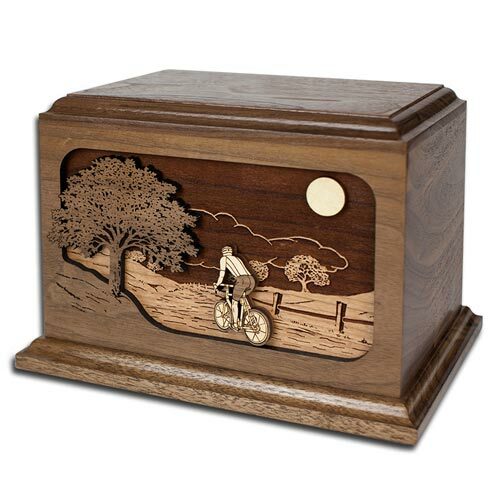 The Bicycle Road Home cremation urn is made in your choice of Walnut (as shown) or solid Oak wood. The scene features wood inlays in three dimensions, layered over a laser etched background with your beloved cyclist in the foreground. Woods used include cherry, walnut, and maple along with the choice of wood for the outer box. Options include laser engraved personalization (as with all of our 3-dimensional inlay art urns) and choice of cyclist – road or off-road bicycle. A popular memorial for hunters, hikers, and lovers of the outdoors, this gorgeous mountain scene features a tall tree and a deer in the foreground, with a mountain lake in the background. Shown here in Walnut, the box can also be made in your choice of solid Oak, Mahogany, or Maple wood. 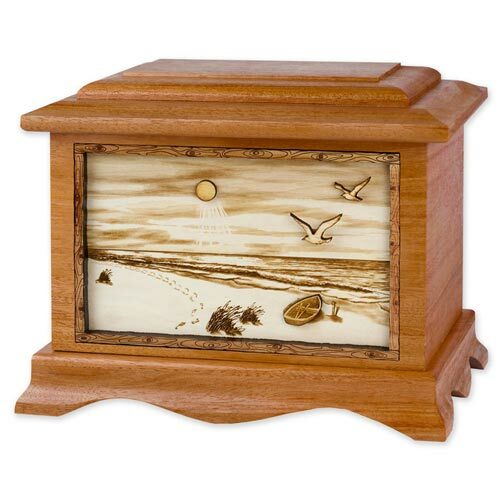 The “Walk on the Beach” solid wood cremation urn is shown above in lush red Mahogany wood. Solid wood all the way through, including the laser-etched scene elements, this is a lovely memorial for anyone who loved the beach or the ocean. The “Tranquility” is a solid walnut cremation urn hand-turned on a lathe from a solid piece of stunning walnut wood. Hand turned urns are true works of art, and if you would like to see more we have several styles available here. Here is a work of art crafted in the shape of a book or Bible. 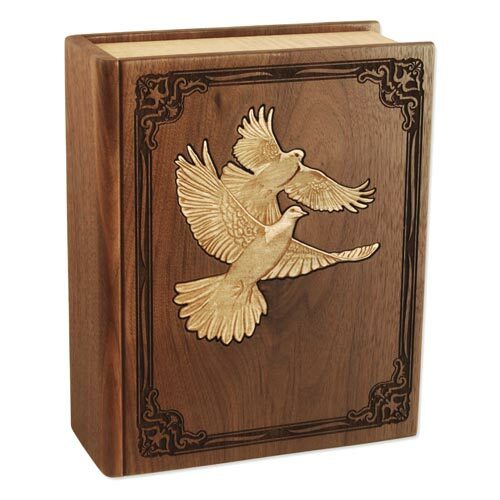 The urn uses Walnut wood for the cover and maple inset along the sides for the “pages,” which are laser etched for detail. The centerpiece is the inlay of doves in gorgeous Maple wood. Doves aren’t the only design available in this stunning “book” series. We also have a cross, a Celtic cross, Star of David, and a personalized book option. See all choices here. Solid cherry wood with a rich cherry stain, this cremation urn is highlighted with the stunning laser etched art carvings surrounding the entire piece. 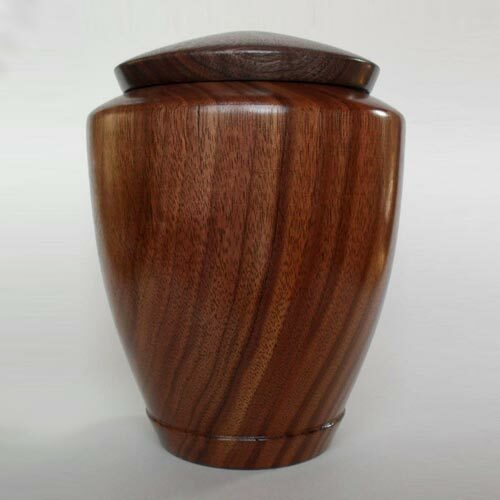 A beautiful wooden cremation urn tribute to your loved one. This gorgeous all-wood cremation urn showcases woodworking at its finest. Handcrafted in the USA, this memorial incorporates a variety of woods including Walnut, Maple, Bubinga, Mahogany, Cherry, and Goncalo Alves. 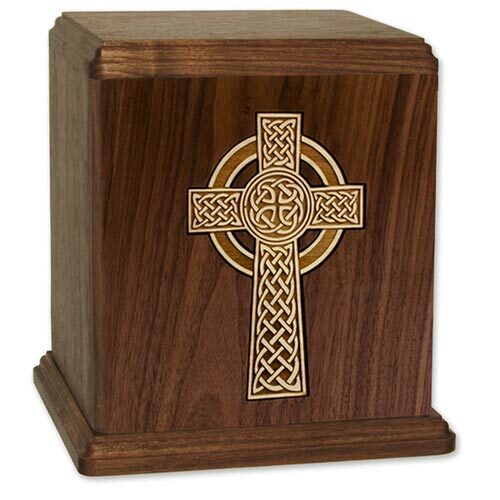 This simple, classic urn is made from real Walnut with a Maple laser etched Celtic cross. Beautiful in its simplicity, this is a lovely tribute to a Christian. 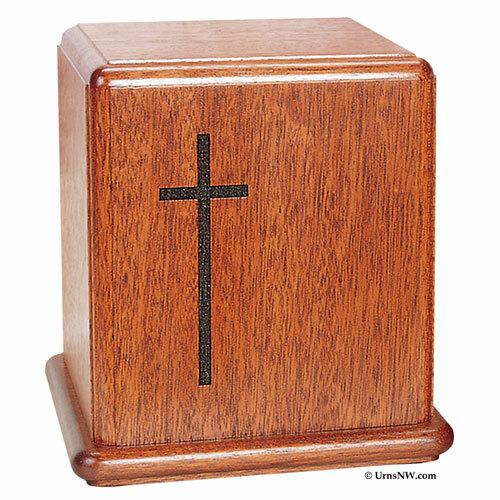 The Laser Carved Series of wooden cremation urns are available in solid Natural Cherry, Maple, or Mahogany wood. Each engraves beautifully, and the urns are etched with a variety of themes that cover all walks of life. Hummingbirds, golfers, trains, fishing, music, lighthouse, dolphins, dragonflies, and many more. All solid wood, all made in the USA, and all available with laser engraved inscription carved into the surface of the wood for a lasting memorial. Can’t decide? Browse all of our best-selling wood cremation urns here. We have a broad selection of designs, styles, and wood types.